Determining how your company will stand out in the real world is a delicate undertaking. 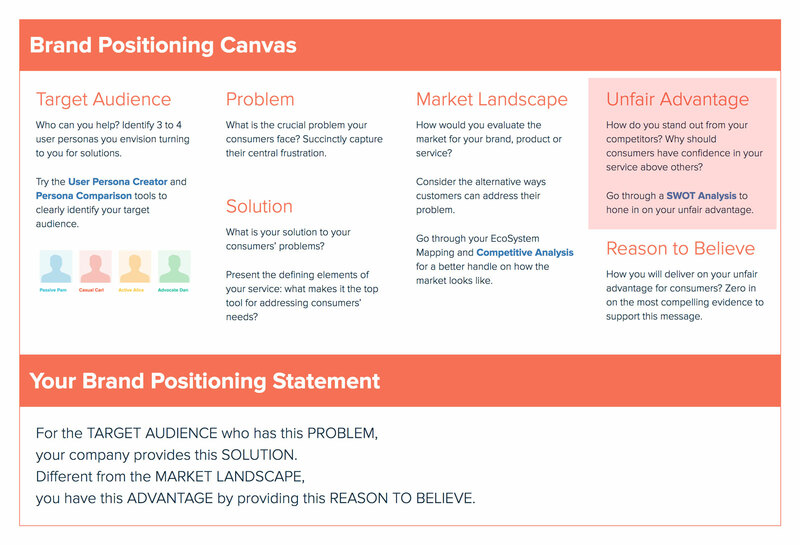 Completing the Brand Positioning Canvas will walk you through the motions of establishing how your product or service will be developed and how its story will be told to your customers. This is a vital internal study to set a strong strategic foundation for the long haul and it will sync your team’s actions under the same values. You will be digging for the core, the soul of your business. Now let’s get to it! 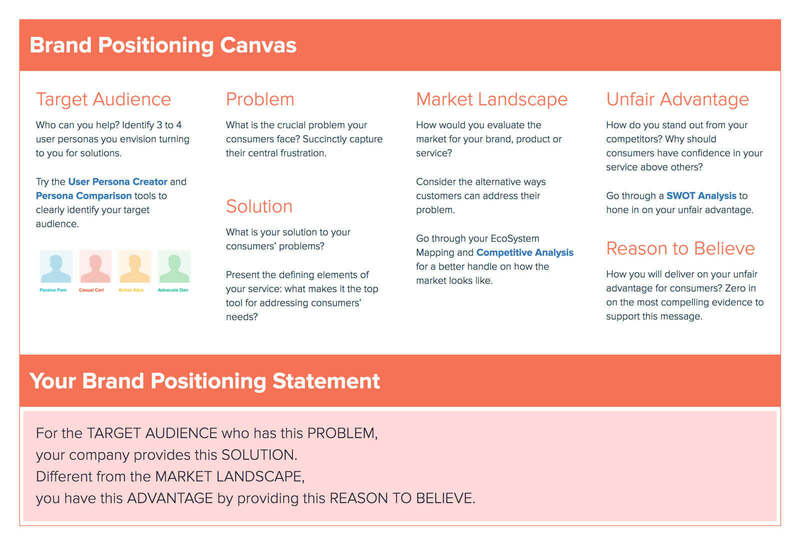 Create your Brand Positioning Canvas now for free! 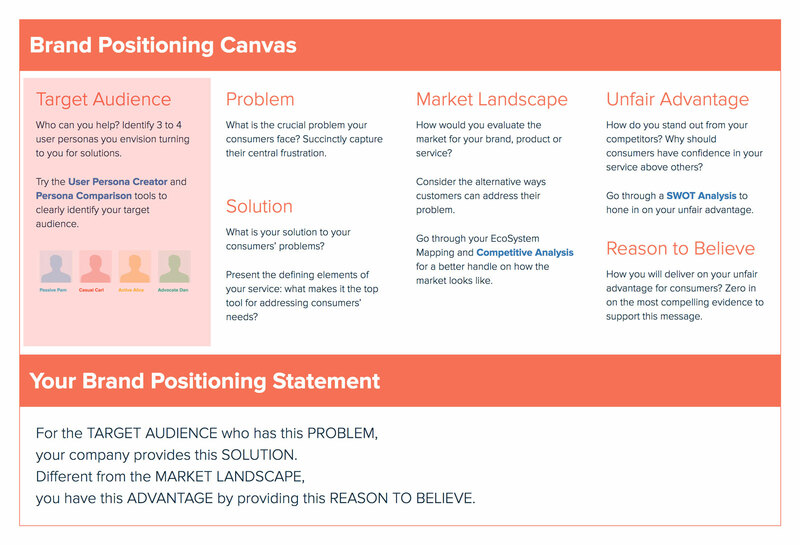 Your starting point to create and share a successful brand positioning canvas, without any design experience. Anchor your company’s strategic thinking with a clear Brand Positioning Statement. Establishing your brand’s position in the marketplace is not an overnight exercise. Whether you are a startup in the early stages of developing a product or a long established company seeking to reinvent itself and stay relevant, positioning and repositioning your brand is meant to be a process. The end result, however, must be a crystal clear brand positioning statement which will inform both internal decision-making and external communications and how the two feed off of each other. In Escape Velocity: Free Your Company’s Future From the Pull of the Past, Geoffrey A. Moore underlines the importance of being able to tell your value in the simplest terms. “Your story has to be told, at least initially in the business language of the problems and not the in the technical language of the solution.” A consistent, overarching narrative of what your business is all about helps shape team dynamics and operations. The development of your product or service is guided by the principles you establish for your brand. It’s the core of your company, allowing your organization to know exactly who you are and what you have to offer. With a clear understanding of your brand position, everyone in your company can stay on the same page. Defining your ideal customer is a challenge in its own right. Today, we are living at a time that some have called the age of post-demographic consumerism. It’s no secret that more and more complex dynamics of consumer behavior are at play today, transcending stereotypes. Segmenting audiences into traditional baskets like age, gender, income, family, location, etc. simply doesn’t cut it. Marketing professionals are developing hyper-targeted messaging to capture the nuances to better reach their audience. There is a flip side to this. Evidently, each user segment will have lots of unique identifiers; but what is it that brings them together? What is that common trait that draws them to your brand? Who’s most affected by a problem? Who will benefit most from your solution? What differentiates people within each audience segment? How does your target audience differ from your competitor’s? Can they be identified by a common goal, desire, aspiration, frustration or challenge? 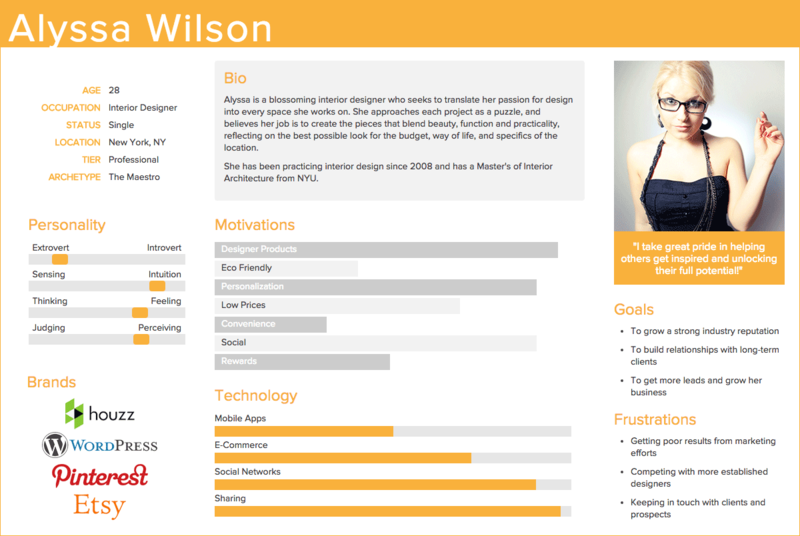 To further explore this road, try Xtensio’s User Persona Creator or User Persona Comparison tools. These are good preliminary steps to analyze your audience as it grows and evolves. It’s essential to succinctly capture the problem you’re trying to solve. Without clearly interpreting the problem that you believe exists in the world, you can’t adequately explain how your product or service will solve it. That said, building a business around solving a specific problem is not always black-and-white. Occasionally, a more obvious problem might actually be a symptom of a greater underlying issue. Everyone and their mother knows about the “faster horses” analogy by now and has opinions about its merits. You can’t always drive business decisions by asking your customers what they want. A solution that drives an invention or an innovation comes from the “why” of it all. If you ask those same people why they need faster horses, they’d probably say something like, “I need to get to work faster.” Now that captures the essence of the issue right there! What obstacles do potential users face in solving the problem? Does the problem cost people time? Money? Both? Has something inefficient or ineffective become the norm and people don’t even realize it? Are other brands trying to address the same problem less successfully? 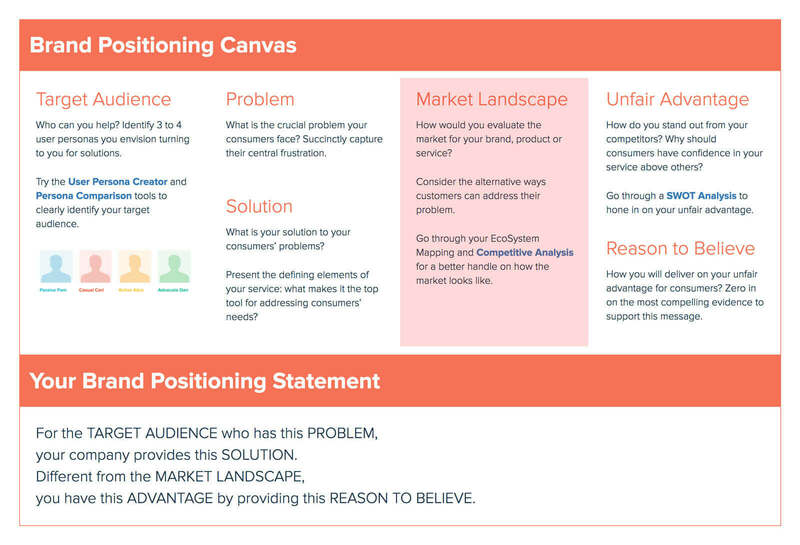 Are you effectively communicating what your solution is adding to your customers’ lives? Consider the ways your product or service is the best option available for your target audience. Is your solution thoroughly solving a problem? Does your solution fit in the marketplace like a glove? Meaning, does it complement what’s already out there? Does it fill in a gap that the competition is leaving open? Is it an invention? Is it creating a new category in the market? Is it a disruptive solution? Will it turn the marketplace on its head, making competition irrelevant? If so, does it have the potential to create a range of problems of its own? How will you fit in the market? Who are your biggest competitors? How is your audience currently solving “the problem”? Often, ideas are born in response to the rise of a dominant player in the marketplace. In other cases, business leaders will assess the landscape, and enter with a similar offering but a clear differentiating angle, going head-to-head with the competition. 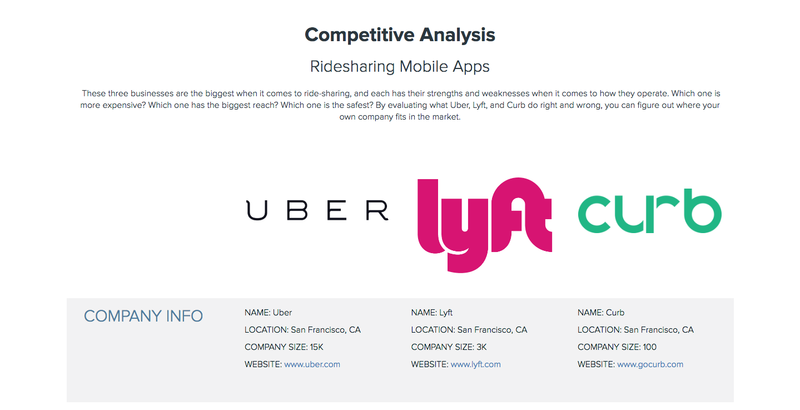 Many companies underestimate their competition in their segment of the market. Anticipating where you’ll fit in the market landscape is crucial for determining what will make you stand out. Keep in mind: Competitors validate that the problem you’re trying to solve has a market and that you have the potential to get a slice of that market by differentiating yourself well enough. 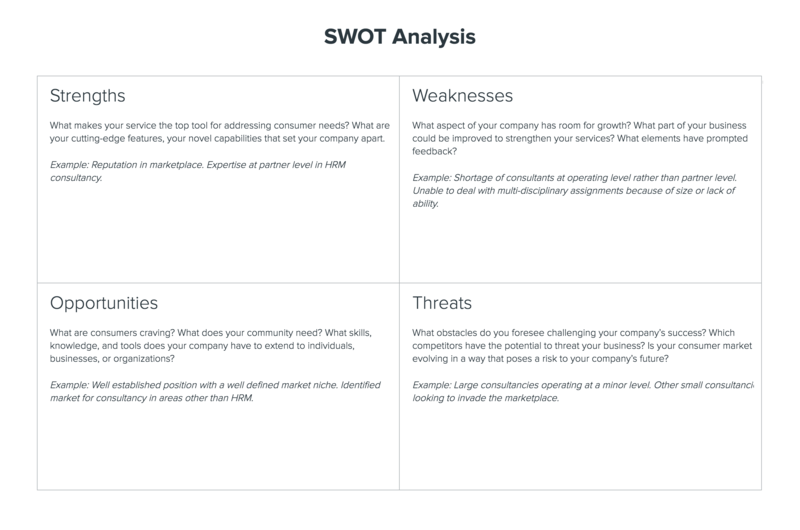 You can tap into Xtensio’s Competitive Analysis template to gain a deeper understanding of your competition. It will give you a good start in comparing the top players out there. Now that you have the lay of the land, you want to explain why your product or service is the best option for your target audience. Do you offer a feature that puts you ahead of the pack? Is your pricing structure more competitive? The distinguishing factors may be on your user facing product offering, but they may also be all about what happens behind the scenes. Your talented and dedicated team, your unique expertise in the field, your processes, your efficiency, anything proprietary that you have created—whatever defines “your way” of doing business. By considering what distinguishes you from your competitors, you can start to think about how to convey those differences effectively. 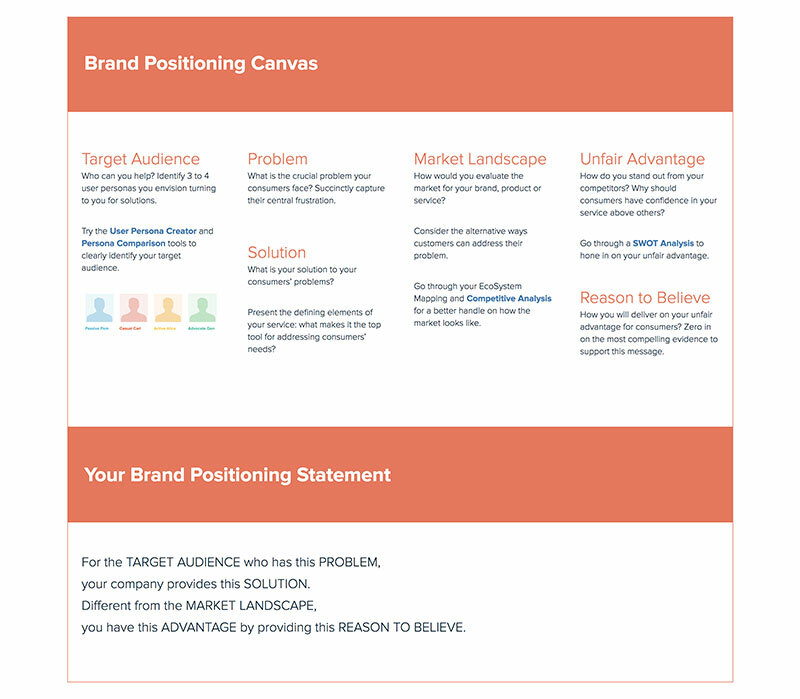 The goal of completing the Brand Positioning Canvas is to arrive at your brand positioning statement, a clear and concise explanation that will guide your team or company in how it makes decisions. This statement organizes the insights you’ve gleaned from going through this process. For the TARGET AUDIENCE who has this PROBLEM, your company provides this SOLUTION. Different from the MARKET LANDSCAPE, you have this ADVANTAGE by providing this REASON TO BELIEVE. Your statement isn’t meant to be used for your marketing, but it will inform those efforts. It won’t be your tagline, but your tagline should spring from it. 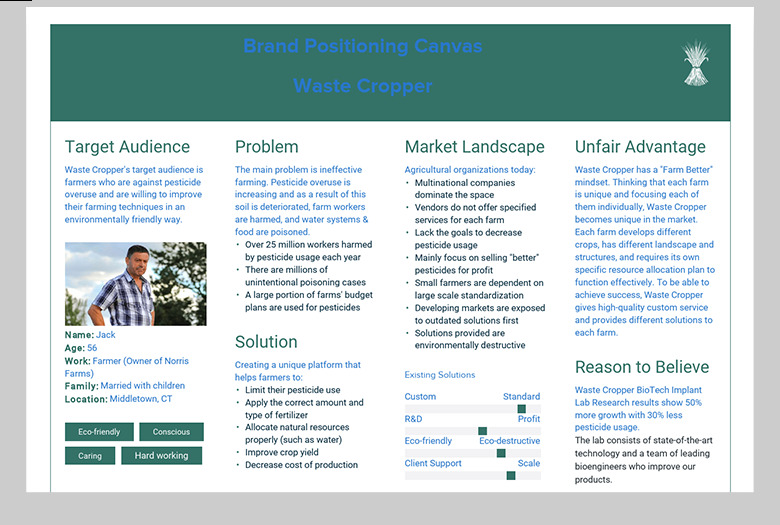 You can be flexible with how you format your brand positioning statement as long as you address the fundamental components of the brand positioning canvas. Defining your brand positioning statement shapes your company’s product, messaging, design and unique value. For larger companies, the brand’s position is gospel; for startups, it provides focus amid growing pains and necessary pivots. The brand positioning statement becomes a resource when you’re faced with the question of whether or not a potential decision is “on brand”. The final statement at which you arrive is just the beginning of your work. What’s most important is the process by which you arrived at this statement, the research you conducted, all aspects of your product or service you weighed and prioritized. As your company evolves, your team grows, the marketplace transforms, there will be times to revisit and keep your anchor in check. Regularly update your ecosystem map, content strategy and conduct usability testing reports. Your positioning will help you stay true to the vision and sustain a strong brand presence.